a person in glasses looking at the camera: Christine Blasey Ford still unable to live at home due to death threats, lawyers say© Pool Christine Blasey Ford still unable to live at home due to death threats, lawyers say Christine Blasey Ford, the woman who accused Supreme Court nominee Brett Kavanaugh of sexually assaulting her, cannot move back to her home due to the volume of death threats she is still receiving, her lawyers told NBC on Sunday. "Her family has been through a lot," Katz said. "They are not living at home. It's going to be quite some time before they're able to live at home. The threats have been unending. It's deplorable." "It's been very frightening," Katz added. Hunt asked Katz and Ford's other attorney Lisa Banks if they believe Ford was treated better than Anita Hill, the woman who publicly testified in 1991 about her accusation that then-Supreme Court nominee Clarence Thomas had sexually harassed her. 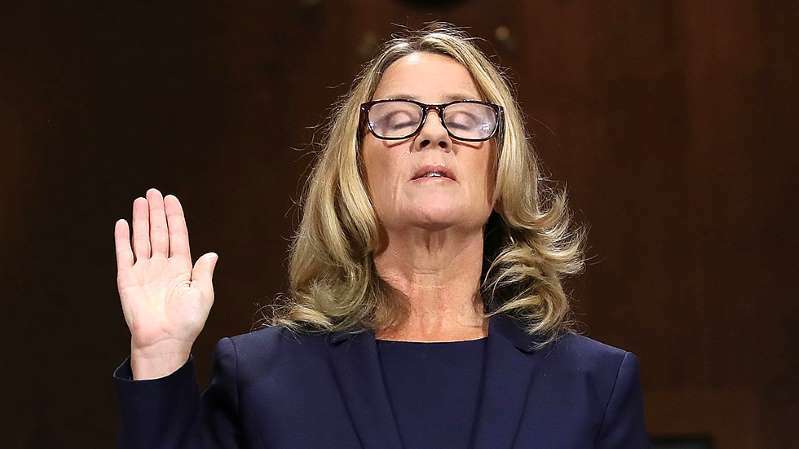 Ford's allegations and her treatment were frequently compared to Hill's during the confirmation battle. Banks and Katz said Ford was "horrified" by President Trump's comments about her last week, during which he mocked Ford's testimony in an attempt to undermine her credibility. Many Republican leaders who voted for Kavanaugh's confirmation, such as key swing vote Sen. Susan Collins (R-Maine), have said they believe Ford was attacked as a teenager but do not believe Kavanaugh was her assailant. Banks on NBC said Ford "knows" who assaulted her.